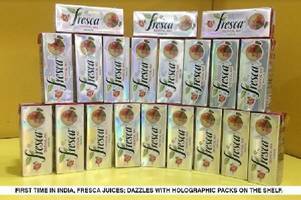 *Fresca*, leading and fastest growing Juice Brands has launched its juices in innovative holographic aseptic packs. The company has come up with 200 ml Tropical Mix and Guava juices in holographic packs in premium Juice category. Fresca becomes the first brand in India to bring out such packing. The Aseptic holographic pack used by Fresca is developed indigenously by Asepto, a Uflex limited company, as a global Innovation developed first time in India. Uflex is the first Indian manufacturer of aseptic liquid packaging material. The holographic technique used in the packaging by Uflex secures brands from counterfeit issues, assuring quality, reliability, integrity and brand protection. Uflex has been offering various innovative holographic options for their customers in the flexible packaging but in Aseptic liquid packaging segment, it’s a debut. *Ashwani K Sharma, President & CEO, Uflex Ltd.* added on the launch, “We knew that the new holographic packaging ”*Asepto Spark*” will do wonders for Fresca as a brand, it’s heartening to know that on the first day of launch itself Fresca has received such massive order book. Now the impact is visible and many leading brands are looking to convert to Asepto Holographic packs. I strongly believe that this is just the beginning and Indian consumers are not only going to get the taste of a great juice but also Asepto Spark “*the holographic packaging*” going to excite and ignite the market on the whole." Uflex made an initial investment of Rs. 580 crore on a state-of-the-art aseptic liquid packaging material manufacturing plant located in the Industrial hub of Sanand in Gujarat. The plant is spread over 21 Acres and has an annual production capacity of 7bn packs.